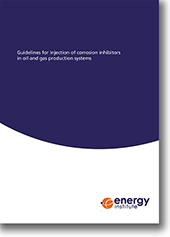 This first edition technical publication provides guidance for the injection of corrosion inhibitors for corrosion control in oil and gas production systems. It builds on the HSE research report RR1023 Reliable corrosion inhibition in the oil and gas industry, and draws on expert industry experience to help operating companies to minimise the risk of pitfalls associated with the application of corrosion inhibitors. This publication contains information relating to the technical and management aspects of corrosion inhibitor injection, from identifying the initial need for a corrosion inhibitor, through considerations for selecting the right chemical, practical guidance on their deployment, and ensuring chemical performance by means of appropriate monitoring. Additionally, this publication highlights considerations for continued operation of producing fields and the resulting challenges for systems that require extended life operation from carbon steel equipment and supporting corrosion inhibitor injection systems. Through effective design and operation, corrosion inhibitor injection systems can provide flexible and reliable corrosion mitigation of carbon steel throughout the anticipated life of producing fields. This document does not consider corrosion control in: pressure vessels; pumps, or seawater injection systems.